Sit down with a brew, it’s a long one…………….. So after finally managing to get a few good runs under our belt, Herbie and I were both feeling confident at Novice and I was starting to excitedly make plans for the rest of the season. It has always been my dream to ride him at an international and it was really feeling like we could be ready to move into the world of FEI and tackle our first CIC* and I decided that Burgham Horse Trials at the end of July would be the perfect event to start our international campaign. However, you will notice that this paragraph is written in past tense! 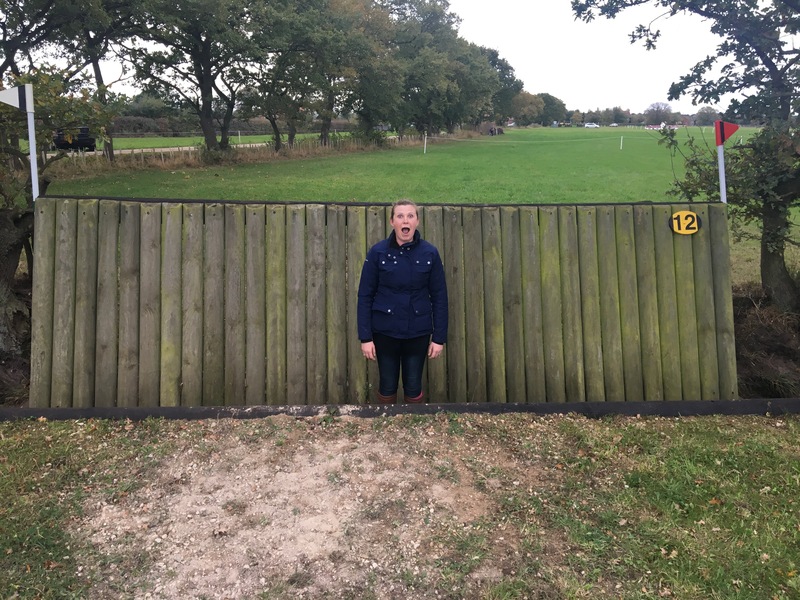 The dream came to an abrupt halt (literally) at Warwick Hall horse trials, were I went against my better judgement and decided to run, even though I knew the ground conditions were not suited to us. Due to our location, Herbie and I spend the majority of our training sessions stomping about in the mud, and as such this is his favourite ground to run on and where he feels most comfortable. He does not like hard ground and last year I had to withdraw from a few events because he simply would not jump on the hard ground. Unfortunately the ground at Warwick was hard. And then it rained meaning it was not only hard but also extremely slippery. This is in no way down to the grounds team at Warwick, who had done a sterling job at preparing the ground as best they could, but event organisers cannot control the weather and it was really unfortunate that after weeks of wall to wall sunshine, the heavens decided to open the morning of the first day of their horse trials! Off we went to the dressage and I could tell straight away that Herbie was bringing his A game! He warmed up beautifully and I went into the arena feeling like CDJ on Valegro, which in turn made me ride much better than usual, and we produced a pretty foot perfect test. All the while in the back of my mind I was thinking that the ground was just not right for him to be jumping on but sadly the competitive streak in me came out, and knowing I would be in a good position after the dressage I headed over to the SJ hoping that we would be lucky. He warmed up fairly well, a little uncertain on landing at times but was really pinging the fences so into the ring I went. And then it all went wrong!! Cantering to the first fence I was on a perfect stride, but as he went to take off his front feet slipped and we skidded completely through the first fence. Poor Herbie felt me pitch forward and tried to take off again mid skid, throwing his head back and splitting my lip in the process. He rarely makes mistakes when jumping and I could feel him trembling so knew he’d really given himself a fright. Fence 2 was a very small upright on a slight uphill run so I popped that, put my hand up and retired. I was (and still am) absolutely kicking myself that I put him in that position. I think a lot of it came from my ambitions to event at higher levels, but I let that take over and I forgot that he’s my only horse, he’s only 6 and I am not out doing this every single week on lots of different horses so I have to really look after him! So huge lesson learnt and it’s still upsetting now to think of how much worse it could have been. Later that week I gave him a jump at home and could really feel how much confidence he had lost, and when I took him XC schooling a week later I knew it was going to take a while to build ourselves back up. So that’s Burgham 1* out of the question and I have decided to drop back down to BE100 for a few events until we regain our confidence to move back up to Novice. Last weekend I took him to Skipton having asked the secretary to swap me from the Novice to 100 and although he had a few green moments in the SJ, he started to feel like his old self again, especially on the XC course where I went round with the handbrake on much to his displeasure due to the firm going. Thanks to Nick Gill Photography for the fabulous photos! So we are now on Plan B which is to go and have fun at 100, do a regional final as I have a qualification from last season and then move back up to Novice when we both feel ready. I’m still hopeful we can take on a CIC* this season, albeit later than planned, but if not then it’s no big deal – there’s always next year! So moral of the story is always listen to your gut instinct! Next month we will be heading off to Buckminster, Northallerton and Cholmondeley Castle before heading back to Skipton for our BE100RF with loads and loads of SJ practice in between! Hope you are all enjoying the gorgeous sunshine! Although it does feel very hot I’m not going to complain after 8 months of winter!! Hurrah! The weather has improved, we’ve had a very busy month and it’s all systems go! Herbie followed up his good run at Richmond with another fantastic effort at Warwick Hall in the Novice. I’ve not been to this event before and I have to say that I am very impressed with the standard of events ‘up North’ as despite the weather, the going is always great, and the Cumbrian views are amazing! We managed a respectable dressage of 32, had one pole SJ and then a fab clear XC round a track that definitely didn’t play to his strengths being quite twisty and full of combinations. We had one slightly ‘uh-oh’ moment on realising that there was a fence actually in the water after the drop in, something we haven’t encountered yet, but Herbs had a good look, slithered over and completed the course clear with just a few tp’s. The weekend after we attended one of the Gatehouse Stepping Stones training days run by BE for people wanting to step up to 1*. The day consisted of dressage and show-jumping sessions in small groups of 3 taught by Richard Carruthers. I had a great time and found it so useful. Richard quickly worked out that most of our little issues are down to me (surprise surprise) and I just need to stop chasing perfection all the time! I told him that it is because I’m so worried that I am letting Herbie down by not being good enough to ride him to the best of his ability, to which he swiftly replied that I created his ability in the first place as I produced him and I need to stop being so hard on myself and just enjoy it. We had a revelation in the jumping by realising that Herbie is so polite that he is over reacting to my half halts, coming back too much and as a result having poles down. Now in an ideal world I just need sit still and never interfere, however it’s a very hard habit to break and will take a little while! So instead we have changed to a Nathe straight bar and no martingale to allow Herbie to take the contact forward and up (and basically ignore me 😂) and WOW what a difference! Really looking forward to seeing if it makes as much of a difference at an event as this is obviously where my nerves of not being good enough really take hold. Next port of call was Brand Hall and the less said about that the better. I don’t often have bad competition days but when I do, I do it in style! A combination of getting lost, being beyond late, a 15 mins dressage warm up, a very annoyed horse and an attack from a savage horse fly meant we gracefully admitted defeat and left after the dressage. There’s always another day! 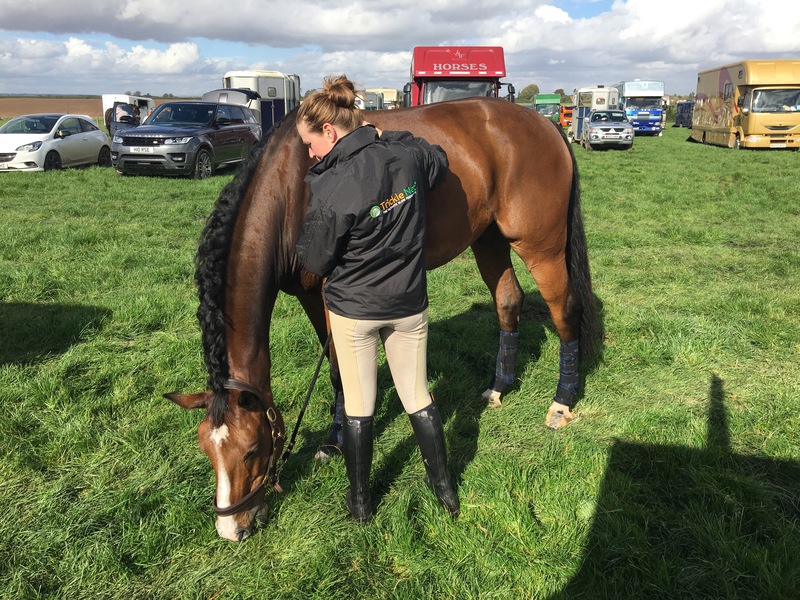 Lovely 4 year old Jalisca went to Chatsworth International Horse Trials for the BYEH qualifier at the beginning of the month, and what a star she was! Anyone who has been there will know what a huge buzzy atmosphere it is and she behaved impeccably, taking it all in her stride. Unfortunately she took a major dislike to fence 4 but I couldn’t have been happier with her and her owners thoroughly enjoyed our day out. I say it every time but I can’t wait for her future. She felt very tired at the end so we decided to give her a week off followed by an easy few weeks of hacking which she has really enjoyed and is now fresh and ready to start preparing for her first little event at the beginning of July. I’ve had a super busy few weeks at work, preparing for our first public event at the Stud, selling 2 lovely youngsters that we have produced, foaling our second mare of the season, hosting (and completing) a 3 day First Aid at Work qualification, as well as keeping the rest of the yard ticking over. There’s certainly never a dull moment! 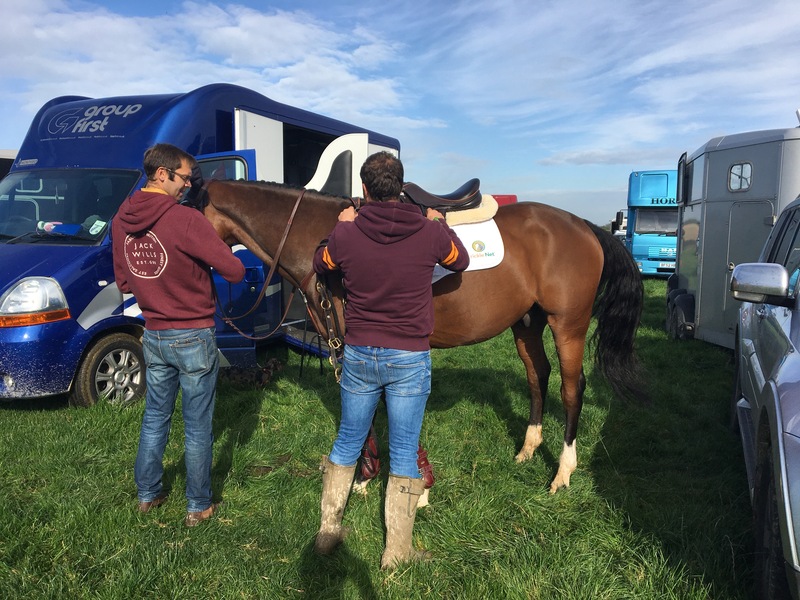 The plans for June are to take Herbie to do 2 Novices at Warwick Hall and Skipton, with lots of jumping practice in between so we can get used to our new bitting system and get Jalisca out XC schooling and show-jumping a few times ready for her competitions in July. 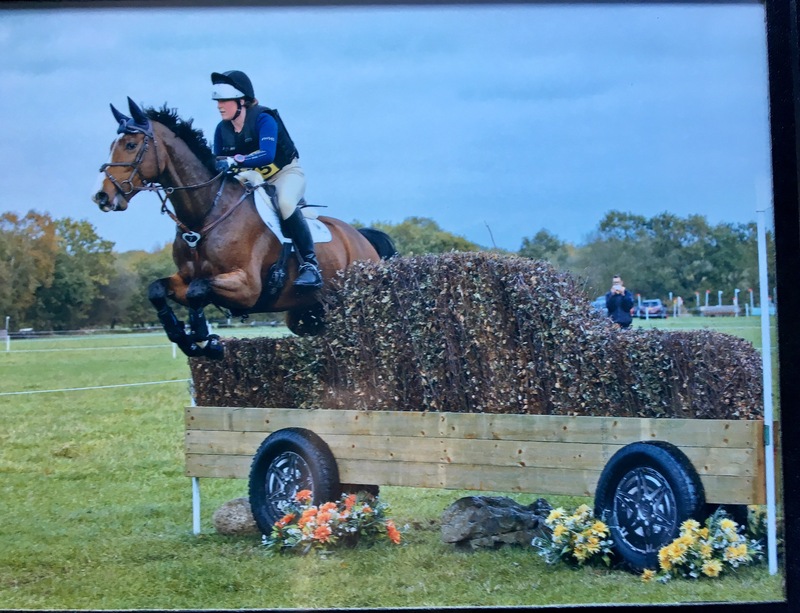 I also plan on going for a day out to Bramham to walk the course for when Herbie is ready to go there in a few years time…………… Hey, a girl can dream!! Firstly, sorry it’s been so long! Following on from my last post in February, we have finally started the event season, albeit a lot later than planned thanks to the great British weather and a bit of a tumble resulting in me having concussion for a few weeks! We had a few months of depressing texts from BE telling us everything we had entered had been abandoned, but at least it gave us time for plenty of training! I was lucky enough to be chosen to be a demo rider at the BHS National Convention and had an amazing lesson with Chris Bartle working on xc technique for difficult fences. Chris worked us hard and I learnt so much which has really helped me so far this season. As well as this poor Herbie was subjected to lots of dressage which he wasn’t too impressed about, and lots of XC schooling where he was a lot more enthusiastic! Finally the sun came out and we have now completed 3 events successfully and are back into the swing of things! 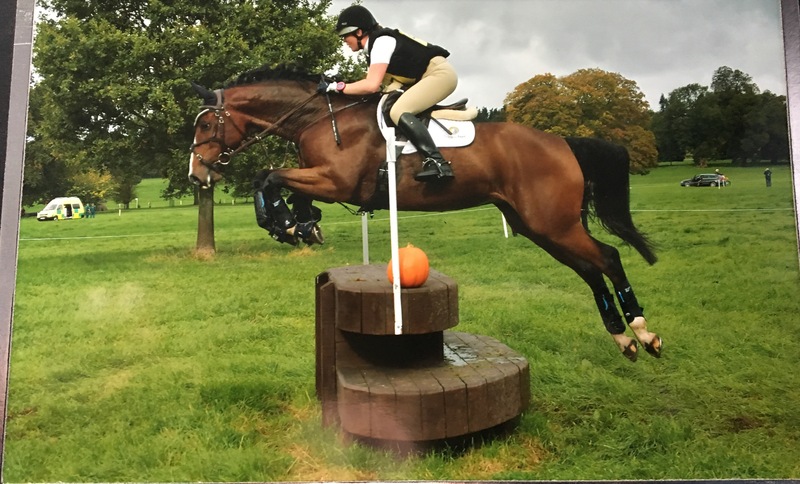 Due to all the cancellations, our first event was actually Kelsall Hill Novice rather than a nice little BE100 as I had planned – nothing like throwing him in at the deep end! Given the lack of practice and a less than ideal run up to the event, he coped really well and other than being very ring rusty in the SJ we had a pretty good day! He really impressed me with how bold he was xc as he tackled it with ease despite me leaving the handbrake on! After this we decided to have an easy run at BE100 to get our confidence back in the show jumping. This proved to be a very wise move as he produced a lovely double clear and was placed 8th which I was over the moon with. Last weekend we stepped back up to Novice at Richmond. He produced his best dressage test to date which I was thrilled with as last year he was very tricky in this phase. All credit goes to my amazing trainer Silvia who has worked miracles in persuading us both that dressage can actually be quite enjoyable! Sj was much improved from Kelsall around a very up to height track. We still rolled 2 poles but they were genuinely unlucky and no fault of his so I am certain with more outings we will get this phase nailed. As usual he produced an immaculate clear xc, making nothing of some pretty big solid fences and I actually rode forward and made the time! We were just outside the top ten but I couldn’t be happier with him and I am sure the placings at this level will come very soon! 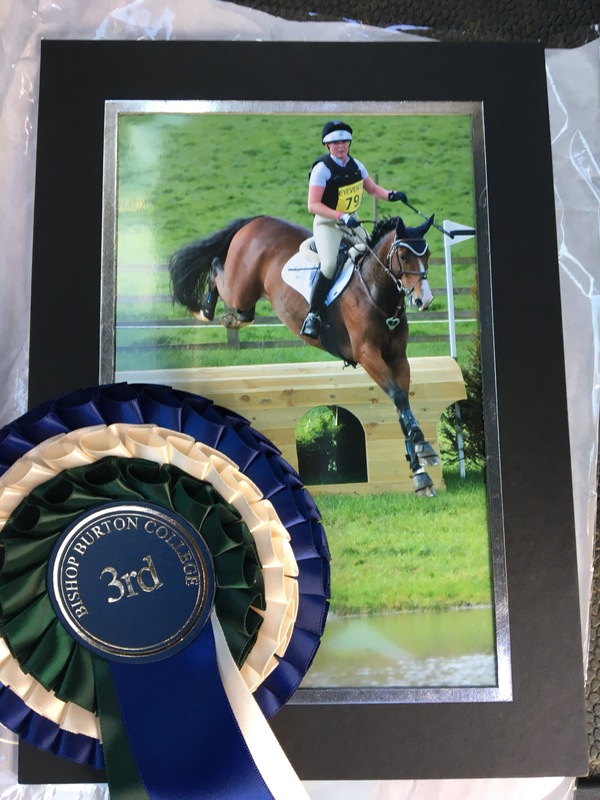 Jalisca has also started her competitive career with a few local outings to familiarise her with a show environment, followed by her first big outing to Badminton to compete in the Burghly Young Event Horse qualifier! It was a bit of a baptism of fire given that it was such a huge atmosphere and she had a lot to deal with but she took it all in her stride and really impressed with her attitude. There are great things to come from this lovely mare and myself and her owners are very excited about her future. Over the next few weeks Herbie is entered in the Novice at Warwick Hall and Brand Hall and Jalisca heads off to Chatsworth on Friday for another BYEH qualifier and will then start her xc training in preparation for her first BE 4 year old qualifier at Stafford in July. 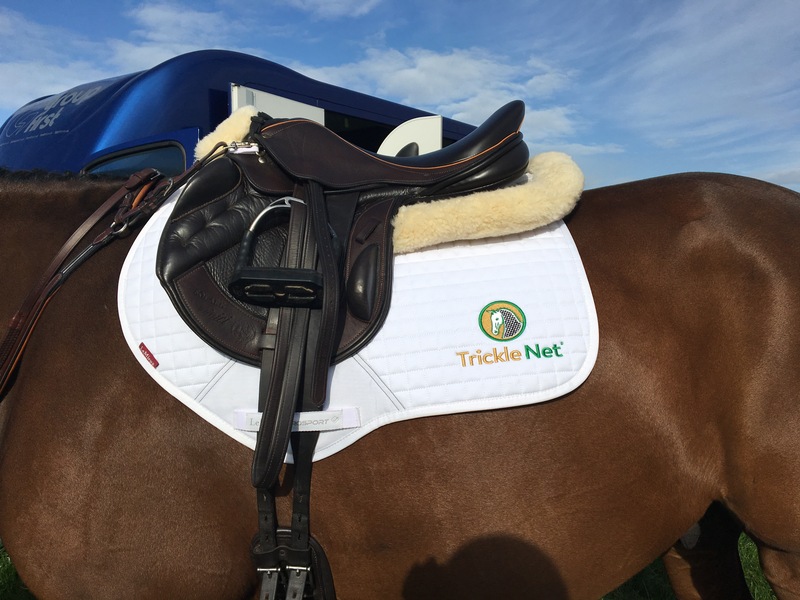 Both horses are in fantastic form and looking fit and trim thanks to their Trickle Nets! So that brings us up to date and I won’t leave it so long next time! November is generally a quiet month for event horses and Herbie has enjoyed a well earned month off after his last event in mid October. The weather hasn’t been great but he managed to spend most days out in the field enjoying some down time with his mates and has relished the challenge of getting as muddy as possible. Sadly for him, Herbie isn’t blessed with a fast metabolism so doing no work means he piles on the pounds very quickly. His Trickle Nets have been an absolute God send for allowing me to monitor his forage intake whilst ensuring he has Haylage to last him all night! He started his walking work last week and will continue to build up his road work for the next few weeks which is very boring but so important for building the strength and fitness he needs for next season. The only problem with this is that he’s feeling rather fresh in this very cold snap we are having so the neck strap is earning it’s keep!! Just because Herbie has been on his holidays doesn’t mean I’ve been bored. Toya has been progressing really well with her training and notched up another fantastic BD score this month. Now her flat work is so much more established I have started to pick up the jumping again and I can really feel how much stronger and more balanced she is. This in turn has really helped her confidence as she feels more physically able to cope with the jumping work and therefore is so much more ridable. We really can’t wait to get her out to some events next season and see how a winter of training has improved her! I also have a lovely 3 year old mare called Jalisca, who I am very excited about! She is owned by White Hill Stud the same as Toya, and is by Crespo VDL who just so happens to be Herbies sire! So I have very high hopes for this lady to follow in her brothers footsteps! So far she has been an absolute pleasure to back and ride away, taking everything in her stride with the same chilled out attitude as her big brother. She will quietly continue her education over the winter and all being well she will be produced for the Burghley Young Event Horse and BE age classes next summer. So, that’s 3 exciting horses for next year, and lots of planning to do in the next few weeks to produce work schedules and competition schedules for all of them now the British Eventing 2018 fixtures list is out and I am already counting down the days to the first event of the season! But for now it’s thermals on, neck strap at the ready and a rather round, hairy horse to attempt to stay on…………………. Wish me luck!! /wp-content/uploads/2016/11/official-logo-text.png 0 0 Ellen Chapman /wp-content/uploads/2016/11/official-logo-text.png Ellen Chapman2017-11-28 11:47:302018-07-04 11:48:42Winter is here!